Check out our Resources page to learn more about the Oregon Nikkei Legacy Center's programs, which provide tangible reminders of the richness and vitality that ethnic minorities can bring to societies that hold sacred the rights of its citizens and regard as a blessing the diversity of its people. Beyond the Gate was originally created as a temporary exhibit for the Oregon Historical Society by Dr. Jacqueline Peterson-Loomis with the help of Carey Wong, Jennifer Fang, and the Portland Chinatown History Foundation. This expanded version of Beyond the Gate is the new permanent exhibition for the Portland Chinatown Museum. Visit www.portlandchinatownmuseum.org to learn more. 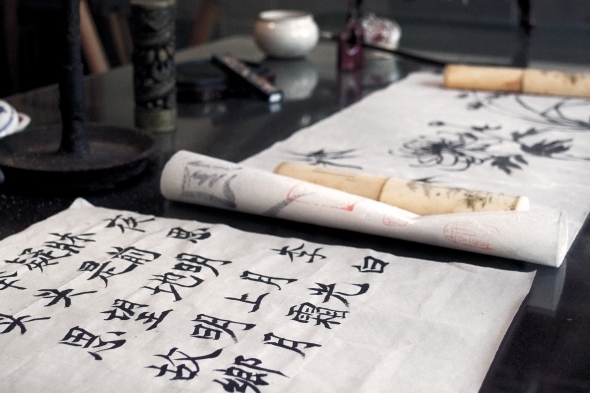 This April at the Lan Su Garden, celebrate the classical Chinese arts of calligraphy, painting, poetry & music. Learn about traditional Chinese scholar's arts with weekly demonstrations, poetry readings and live music throughout the month. Events are included with Lan Su admission unless otherwise noted. Visit www.lansugarden.org to learn more. This original, comprehensive exhibition about the Portland and Oregon architect Will Martin (1930-1985), best known as the designer of Pioneer Courthouse Square, captures the full range of Martin's creative work as an architect, artist, and imaginative thinker. This exhibition demonstrates the vibrant fusion between art and architecture as it played out in Martin's built and unbuilt work, from his earliest projects in the late 1950s, his modernist suburban work, his playful and experimental designs for private residences, to his forays into postmodernism prior to his untimely death in 1985. Visit visitahc.org to learn more. Shop 'til you drop! This is a unique sale of Japanese collectibles, artwork, dishware, furniture, and more. Items start as low as 25 cents! Something for every age, taste, and budget! All proceeds benefit Oregon Nikkei Endowment. Enjoy free mochi samples, demonstrations, and hands-on activities for all ages including: mochi pounding, mochi making, ikebana, origami, games, calligraphy, and much more! Please visit mochipdx.org for more information. The Oregon Nikkei Legacy Center has a wealth of resources documenting Japanese American history and culture, housing original manuscripts, government documents and publications, as well as historical and contemporary artifacts and photographs.